Vaginas … not so much. 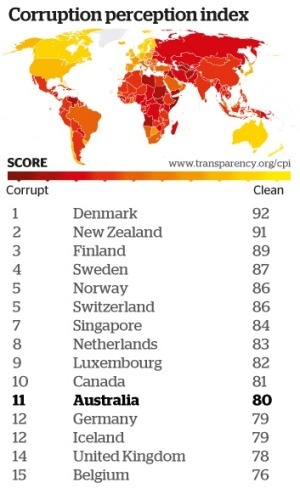 According to “expert analysis of public sector sleaze”, the least corrupt countries are Denmark, followed by New Zealand, Finland and Sweden. The most corrupt? Somalia, North Korea, Sudan and Afghanistan. WILL CANADIAN GAL BRING DOWN US BANKSTERS? Can a gal from Terrace, B.C. bring down the biggest US Banksters? Nature created just four seasons. And “Flu Season” isn’t one of them. And that with some very simple techniques – wash your hands regularly, cough or sneeze into your elbow, and don’t burn out your immune system with too much skiing, partying and work – you’ll probably be one of the 80-90% of Canadians who is flu-free this winter. “Flu Season? ?” Ha! Bring on the snow. EMINEM 12 YEARS AGO – "LOSE YOURSELF"
Eminem singing “Lose Yourself”. From 2002. A bit of staying power? Unh huh! More of a concern for any business using Facebook. But interesting nonetheless. After air and water, sand is the most used commodity in the world. The world as we know it would stop functioning without it – no glass, no highways, no computer chips, no concrete buildings, etc. And due to greed and sand’s value, it is quickly disappearing.